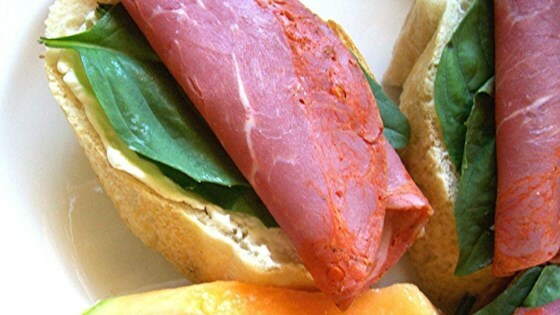 "Easy, delicious appetizer using spicy, capicola ham. Make sure you use fresh basil, as the flavors will not be the same if you use dried. These can be made ahead of time and refrigerated, but be sure to bring them up to room temperature before serving to blend the flavors." Slice baguette on the diagonal into 25 slices about 1 inch thick. Spread slices generously with cream cheese. Place a single basil leaf on top of the cream cheese and press down slightly so basil adheres to cheese. Top with a thin slice of capicola. See how to make a super-easy, meat-and-cheesy party appetizer. Very good and so easy! I used 2 basil leaves per bread slice and served them with sliced cantaloupe. Thanks for the recipe! Really easy and guests liked them. I doubled the basil leaves. This recipe is fantastic! I took it to a dinner party for 8 and we cleaned the plate! Highly recommended.